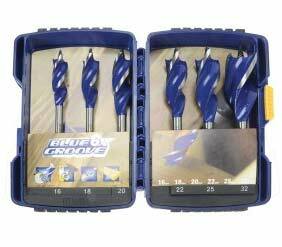 In this series of hand tool reviews we check out the range of Irwin Blue Groove drill bits and their available sets. Having reviewed many drill bits and flat bits we wanted to check out Irwin's claim that these bits are 6 times faster than a standard flat bit and if so, are they actually any good? In this tools review we tested Irwin’s claims that this particular drill bit is much faster and produces a cleaner cut than other drill bits and the results are that they are correct in these claims. This is a very fast drill bit indeed which does not bite into the timber, it simply drills straight through. And quickly. A perfect use for this drill bit is to cut through ceiling joists and rafters for threading electric cables and water pipes. See our project on notching joists to find out more. You can also buy these, and other Irwin drill bits in our DIY Superstore. As well as testing the drill bit with Irwin’s demonstration team, we tested this Blue Groove drill bit set out on site with our carpenters. We went into a very small loft space to drill through some joists to add a loft light. The results exceeded our expectations. These drill bits make very fast work of the job of drilling joists, even in the smallest of spaces. As you can see from our star rating these drill bits are as good as it gets. We consider these to be a hybrid between a normal carpenters flat bit and a standard timber auger bit. The design works well in cutting a neat hole, without tearing the timber rather than cutting it and it is indeed, in our opinion, 6-times faster than a standard flat bit.